Israeli soldiers abducted, on Sunday at dawn, three young Palestinian men, in the Ramallah governorate, in central West Bank, and one Palestinian in Tulkarem, in northern West Bank. The soldiers also invaded Jenin, Bethlehem and Hebron, and summoned several Palestinians for interrogation. The Ramallah office of the Palestinian Prisoners’ Society (PPS) said the soldiers invaded and searched several homes, and abducted ‘Aabed Misbah Mohammad, 16, Rabea’ M’alla al-Malhi, 25, and Ahmad Mustafa Hamed. Eyewitnesses said the soldiers caused excessive damage in Zahran’s home, while searching it, and interrogated the family, before abducting Tareq. Furthermore, several army vehicles invaded Barta’a town, southwest of Jenin in northern West Bank, and broke into a gas station, in addition to installing roadblocks and inspecting the ID cards of many Palestinians. In Bethlehem governorate, the soldiers summoned Shadi Mohammad Badawna, 25, from the al-Jadawel neighborhood in Beit Jala city, and Qoteiba Issa Saleh, 25, from Wad Shahin area in Bethlehem city, for interrogation at the Etzion military base and security center. 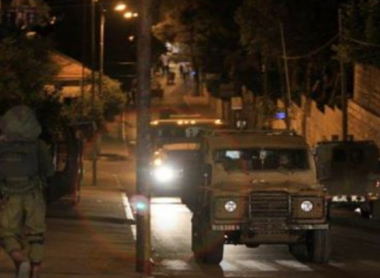 The soldiers also invaded Beit Ummar town, north of Hebron, and summoned a former political prisoner, identified as Ali Ahmad Sabarna, for interrogation in Etzion, after searching his home and another home in the town. In the Gaza Strip, the army abducted two young men, near the border fence, east of Rafah, in the southern part of the Gaza Strip, and fired many live rounds into Palestinian lands close to the fence. In related news, the soldiers abducted, overnight and at dawn Sunday, at least ten Palestinians, more than half of them children, in several parts of occupied East Jerusalem, after the army invaded and ransacked many homes.